Create shortcuts of apps, activities on your phone using App Shortcut Maker.Top Reviews:XDA:Create shortcuts for apps and app activities with ease, allowing you to use custom icons and even comes with icon pack supportAndroid Police:App Shortcut Maker can see a bunch of app processes and put them on the homescreen with ease, including custom app icons from images or icon packs.Android Community:‘App Shortcut Maker’ lets you create shortcuts not only of apps but also other activities on your smartphoneAndroid Headlines:App Shortcut Maker is an Android app that makes it super-easy to further extend the usefulness of your Android home screen. 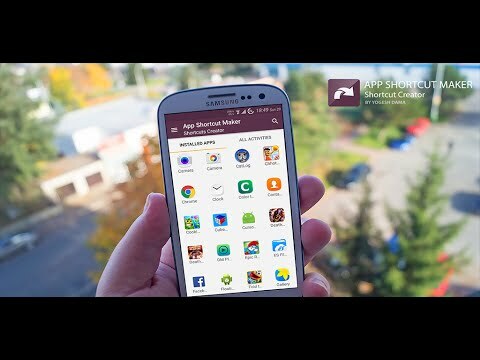 It does this by giving users the power to make a shortcut of any app, any Android shortcut, or any Android activity.App Shortcut Maker allows creating shortcut with variety of unique options like:✔ Custom shapes for the shortcuts. Unique option that allows creating shortcut icons with heart, Ace, apple shapes.✔ Icon packs supports, all Nova, apex, Adw, Aviate, Go, Start launcher icon packs supported, choose any icon from these icon packs for Creating shortcut.✔ You can create app shortcuts using images from gallery.✔ Rename the shortcut name.✔ Search Apps & Favorite Apps options allows quick and fast finding of your apps you want to lunch.✔ Create shortcuts for any activities, There are internal activities in the apps, you can browse through them and can create shortcut of theses activities too,You can add pretty much any and all application screens. For example, the stock Clock app does not allow for shortcuts directly to the Alarms page by default, however using App Shortcut Maker, you can add that as a shortcut to your home screen without a problem.You can also use App Shortcut Maker for searching the app which you want to launch.if you know the name of the app, App Shortcut maker will help you finding the app.Please visit www.yogeshdama.com for more detailsIf you like App Shortcut Maker don’t forget rate 5 star ★★★★★ or review.